Dive Journal: Details of this dive day, March 14, 2010, were captured by Linda at torksinthailand.blogspot.com/2010/03/dive-dive-ride.html. We exit the previous dive and it's time for breakfast. The Queen staff has prepared a Western breakfast this morning and we enjoy french toast, bacon, eggs, ham etc. Some folks enjoy the baked beans. I grab waht I think is a strawberry yogurt, but it turns out to be a bean and corn yogurt! Tastes like someone scraped their plate into a yogurt container. We sit around with Kim after breakfast swapping stories. He has lots to tell and entertains us with stories of past customers (even though he says it is not good to talk about his past clients. . .). He tells us that he really has enjoyed diving with us and that we are a "class act." We're sure they get a good mix of both winners and whiners on the boat. We feel lucky to have gotten Kim as our guide. We listen reluctantly as we get instructions for what to do when our last dive is finished - we have to pack up all our stuff and get ready to leave. Last dive. 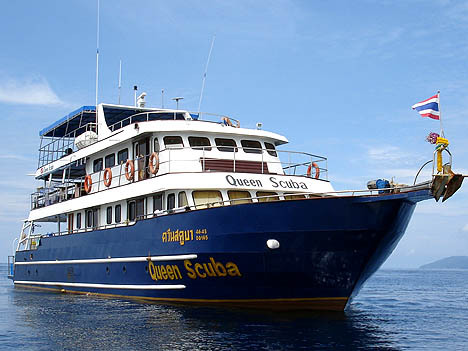 The Queen motors toward the Khao Lak port and stops at a submerged wreck called the Boon Sung. It is a big tin mining rig that fell off of a carrier boat. Since no other structure are around for miles, thousands of fish collect here for the protection it provides. Linda is not really into wreck diving and we are told the visibility will not be very good. Still, I feel so good after that last dive that I very ready to jump back in. We immerse and descend into some pretty low vis, maybe only 10 to 20 feet. At first the wreck is no great shakes, but there are tons of fish. Lionfish especially. We cruise along one of the bottom edges of the wreck looking for eels and nudibranches. The bottom has been pretty churned up, no doubt from divers before us, and the dive is headed into the "mediocre" category. As we turn a corner we spot our first honeycomb eel. A very beautiful fellow emerging from a hole in the wreck. Around him is a wider opening into the rig, and we spot another eel free swimming. Taking in the whole scene, we soon see at least eight eels free swimming in front of us, hopping from perch to perch inside the wreck's interior. It looks like a scene from a Disney movie or something. As we continue our exploring we are slowly rising to the higher edges of the structure, asnd there are many more fish to see. The clouds of fish start getting really dense. Little fingerlings and fusiliers and snappers and silversides and grunts. Our bottom time comes to an end, and Kim leads us right through the thick of it - the fish are so think I can hardly see my dive buddies. We watch them swirling beneath us during the safety stop - great! This dive got really good at the end and is a very nice capper to our diving vacation. We head to our rooms to begin packing up and getting ready to leave. The boat will be at the pier in 1/2 hour. Everyone starts snapping photos of each other and saying goodbye. 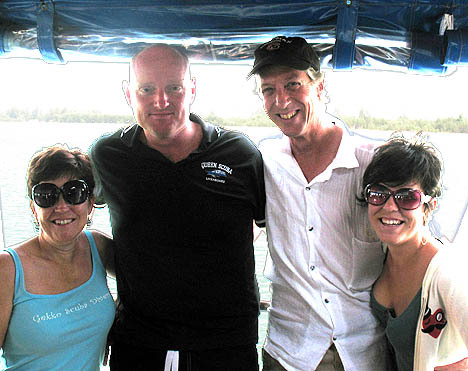 The diving and support staff on the Queen Scuba has been first rate and we feel lucky to have been paired up with Kim. Note: Details of all our 2010 Thailand travels can be found at torksinthailand.blogspot.com.